You've probably noticed that women don't seem to feature very much on the History course. That's History's fault. Men have always tended to take centre stage, no matter where the place or time. There have been important women throughout History, of course: you studied the lady of the manor in First Year, who might not seem like much, but then in Second Year you learned about Queen Isabella of Spain, and Queen Mary and Queen Elizabeth I of England, who both ordered plantations of Ireland. Marie-Antoinette was an important figure in the French revolution, while Martha Washington is just as famous as her husband George. Going forward in time, you learned about life and work in Queen Victoria's industrial England, and in more recent decades you learned of Countess Markiewicz in the 1916 Rising and the role Margaret Thatcher played as British Prime Minister at the height of the Troubles. This part of the course concerns how life has changed for women in Ireland since the beginning of the 20th century. 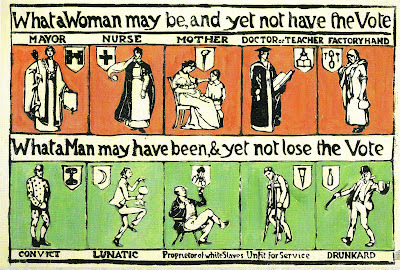 A hundred years ago, women in Ireland were not allowed to vote. Even fifty years ago, women could not be employed as teachers if they were married. 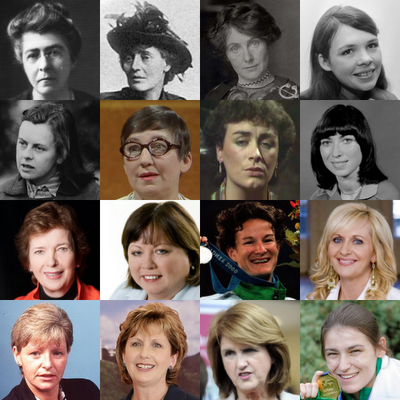 Several Irish women (such as those in the picture above) have made their mark on history, from the independence struggle to today. The role of women has come a long way in a hundred years. 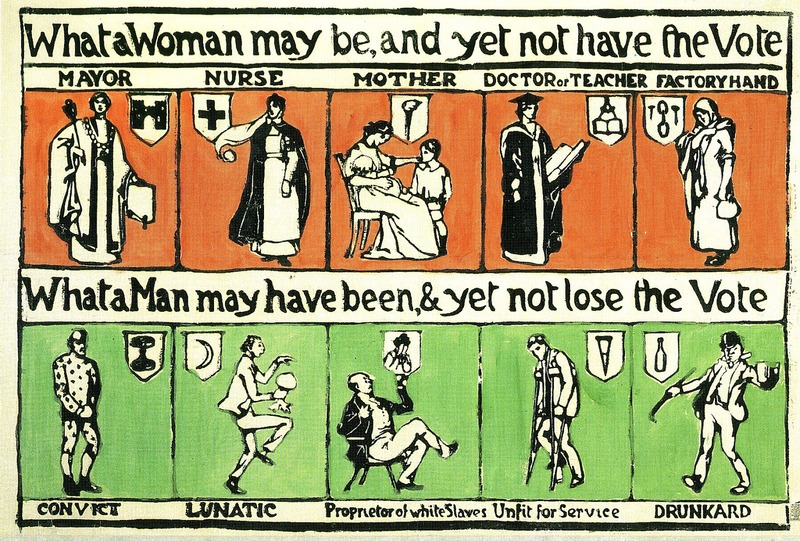 A poster campaigning for votes for women. Click on it to make it bigger. Hanna's House is a group which works for women's rights. It is named for Hanna Sheehy-Skeffington and it has a page dedicated to her and the history of the suffragette movement, which is what this link will bring you to. A UCC biography of Hanna Sheehy-Skeffington. Read a biography of Countess Constance Markiewicz here. This was a feminist group set up in 1970s Ireland in the wake of the report of the Commission for the Status of Women in 1972. Scoilnet provides an overview.